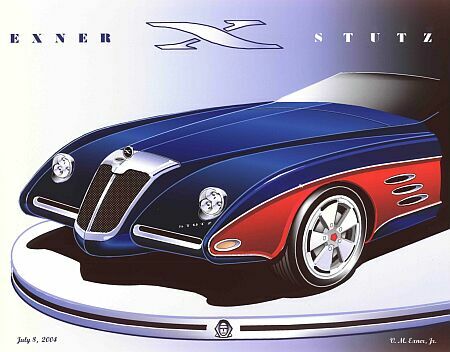 I got an envelope from Virgil Exner, jr.
his contribution for the Meet was a phantastic design for a new Stutz Revival! 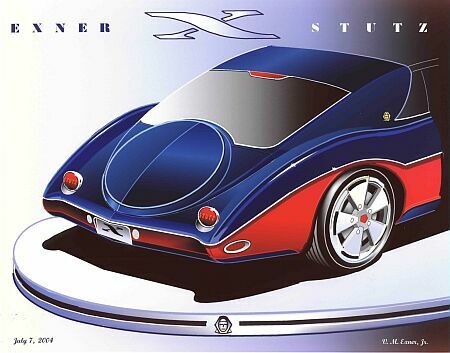 In the late 60's, Exner's father, Virgil M. Exner, sr. designed the Duesenberg Revival project. and it became the very first successful revival project in automobile history. And it still is the only successful! Today, we have several Revival Cars on the market. The first revival, the EB110 failed after about 100 cars. The second revival, now financed by the Volkswagen trust is a 1001hp-beast, top-speed over 400km/h. Maybach, also a German powered project. 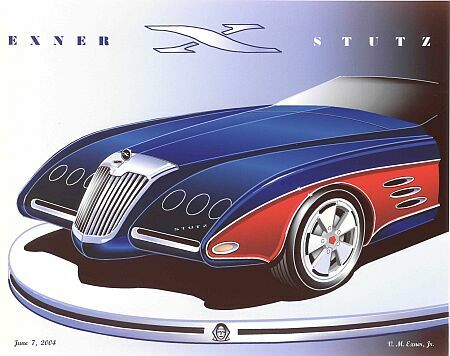 but will they be able to stay in business as long as Stutz, more than 20 years? All the production-revival cars are limousines, or supersportcars. 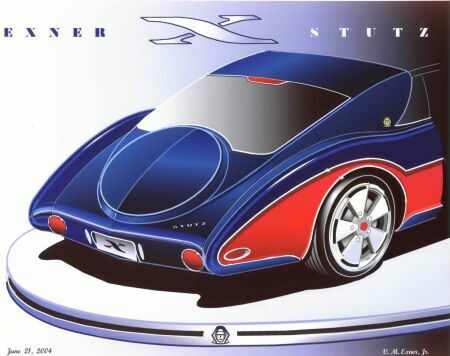 like in the early 70's, when the original Exner-Stutz was put on wheels. that means this Coupe is as long as a Maybach 57! The front-view, showing a radiator grill, a must for a Stutz. The rear-view, of course showing a spare-wheel. Today, there is no need for a real spare-tire, but a Stutz without that detail? 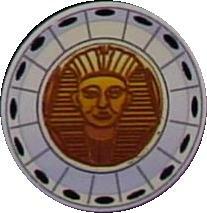 The 1972 Blackhawk Humptrunk wasn't a design success, and so a new Stutz has to show at least a symbolic spare-wheel! The second design sketch for the rear-view shows more similarities with the 1971 Blackhawk. After a phone-call with Mr. Exner, he had the idea to put some freestanding headlights on the car. The radiator grill was also slightly modified. These small changes create a complete different look. And this is definitely a Stutz-face! Mr. Exner also modified the rear-view. Freestanding taillights let the car look more unique, and every car-enthusiast can identify this as a new Stutz. The chrome trimline at the rear, now showing more similarities with the rear-view of the 1971 Blackhawk. so I call it the Spynx-Project. but in my opinion, the name "Spynx" is better! While Europe seems to have some sort of revival-mania, where is America? Like in the 70's, an American has to buy European cars to have an ultimate automobile. 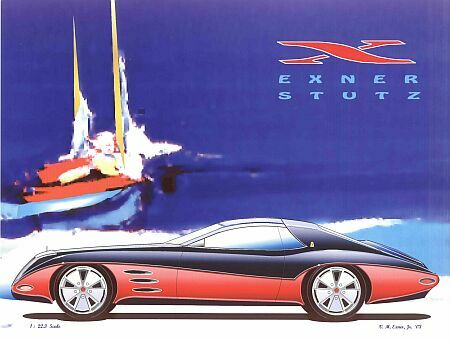 All these design sketches are copyrighted by Mr. Exner. All rights reserved! Do not use without written permission!! !